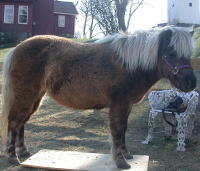 The pony had not been trimmed much until the time she foundered, and grazed on lush grass while under the care of the previous owner, resulting in a combination of probable metabolic and mechanical founder. 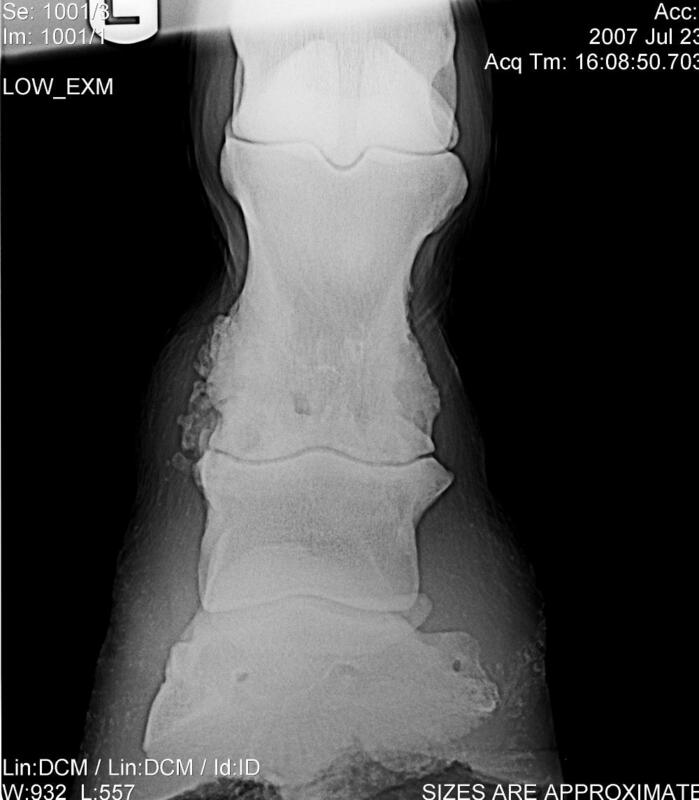 Her X-rays and laminar wedge closeups appear in the posts below. 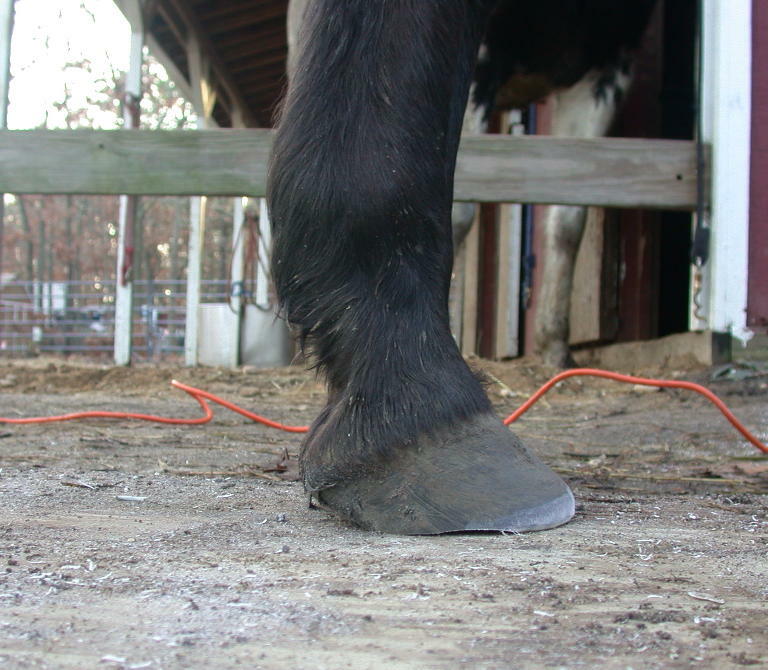 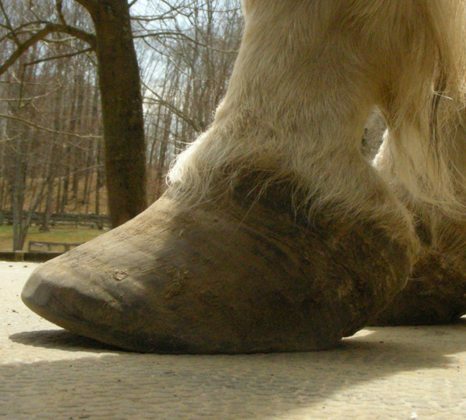 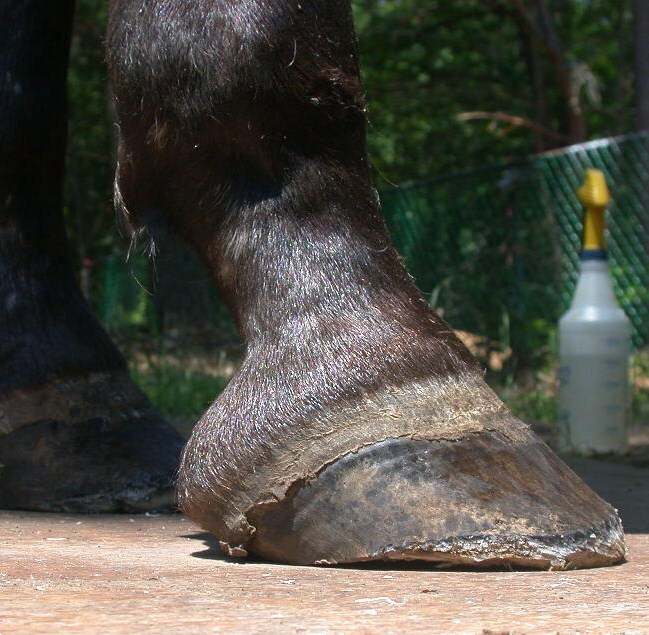 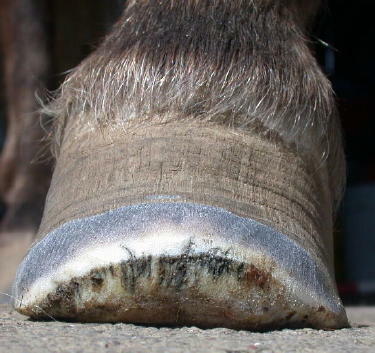 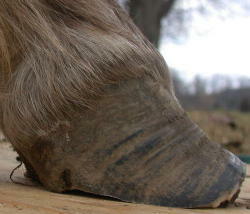 A tight regimen of frequent trimming as well as limited access to grass (using a muzzle) has been implemented, resulting in improved hoof form and a healthier body weight. 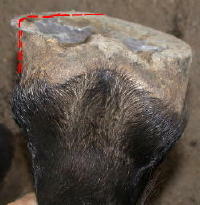 The trimming focused on lowering the heels and backing up the toes, realigning the coffin bone parallel to the toe wall, as well as bringing it closer to a ground parallel orientation. 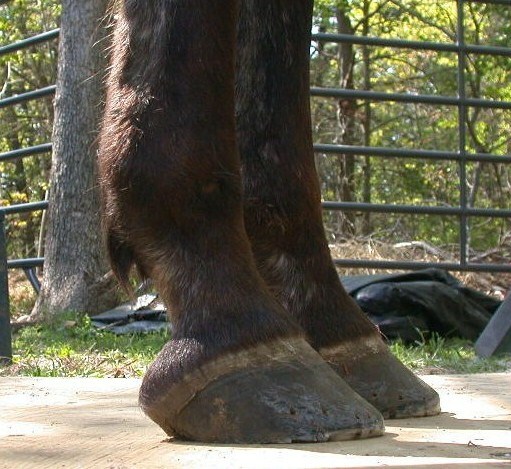 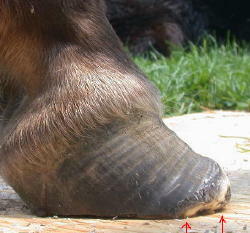 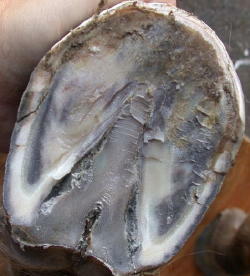 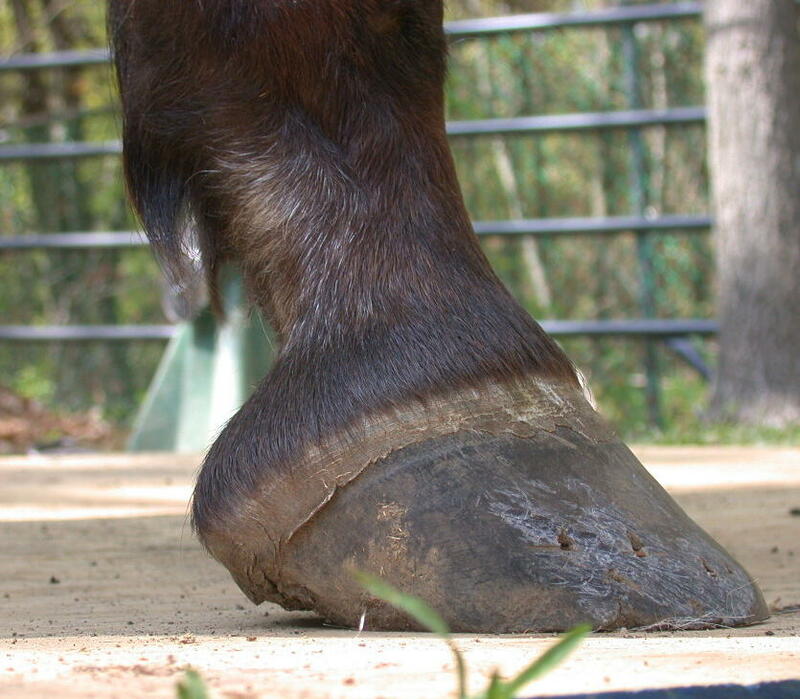 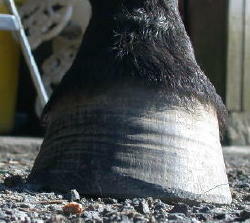 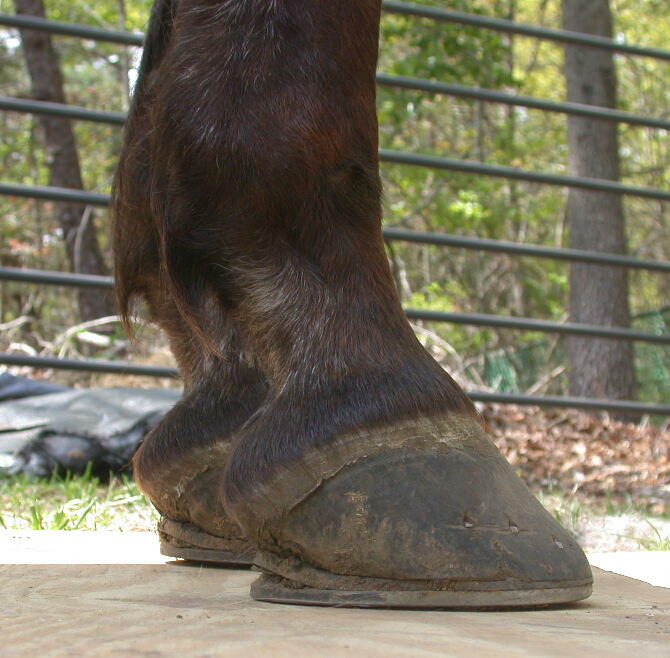 The parallel hoof wall/coffin bone is a primary factor in the prevention of founder. 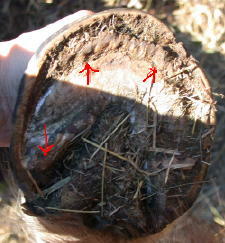 Somewhat difficult to see in the grass, but this is where the corrective trimming started, with high heels and very long toes. 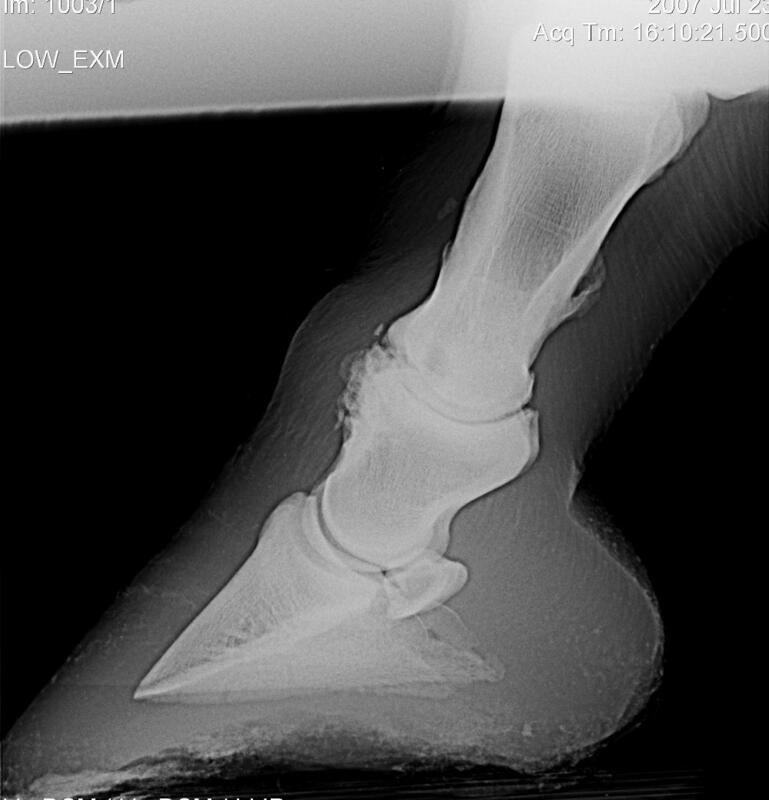 The red arrows at the toe show imminent coffin bone protrusion, along with a wide gulf separation between its edge and the wall. 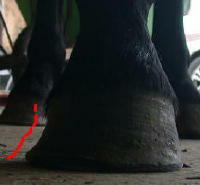 The bar, (red arrow), level with the frog, is high. 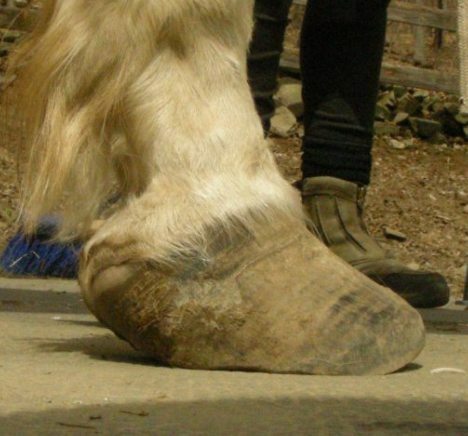 1 mo. 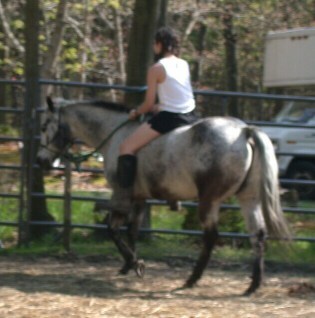 3 mos. 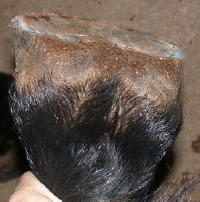 6 mos. 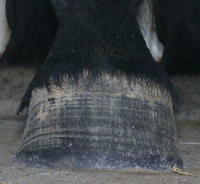 As the hoof wall grows down, the separation (all the way around the edge of the hoof) diminishes, and the white line becomes healthy and tight, enabling it to suspend the coffin bone in the hoof capsule. 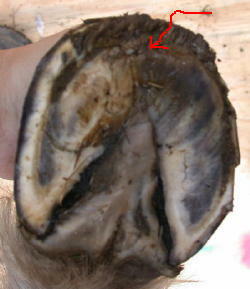 By 6 months most of the hoof wall has grown down with less prominent rings. 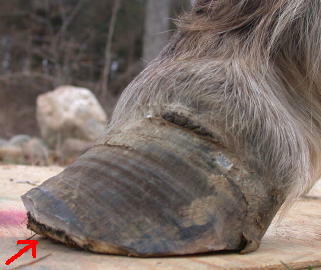 The remaining separation at the toe (red arrows) corresponds to the separation on the sole at the same time frame and will grow out in another month or so. 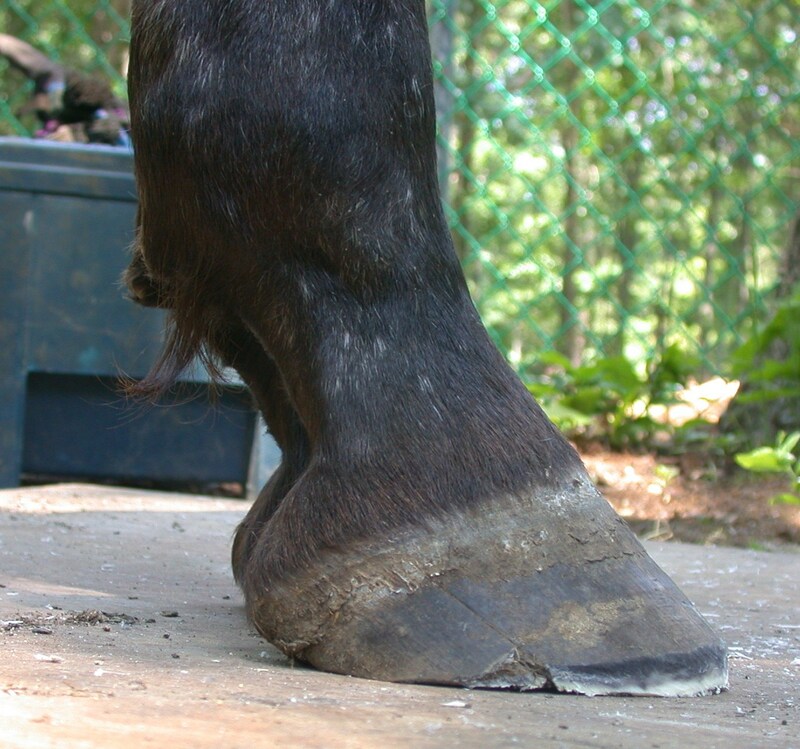 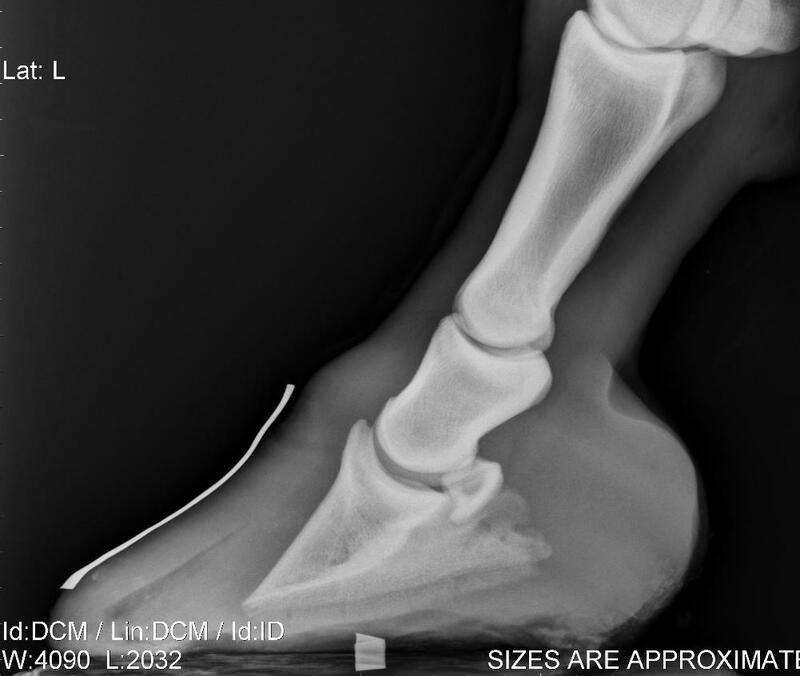 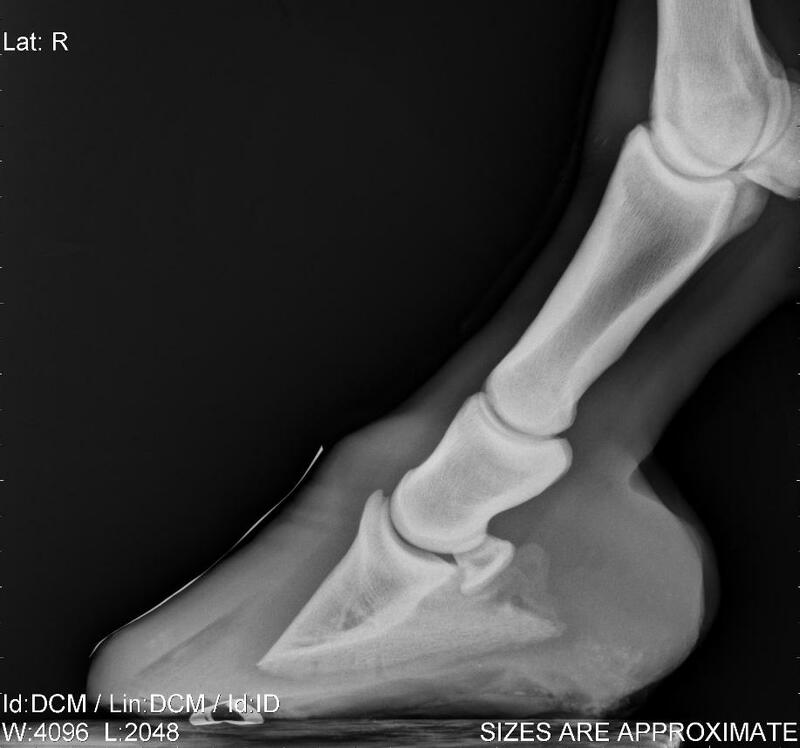 is the space in the front of the hoof at the toe, where stretched and torn laminae have caused the coffin bone to rotate away from the hoof wall. 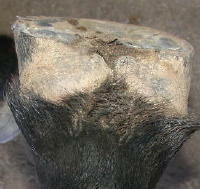 The space between coffin bone and hoof wall has widened at the bottom, relative to the top, and has filled with wound secretion, blood and torn and dead laminae. 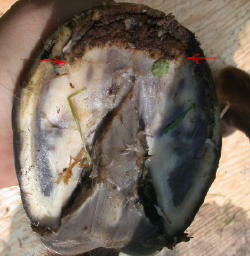 The ‘dead’ laminae are black. 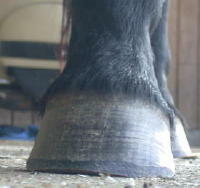 From the side. 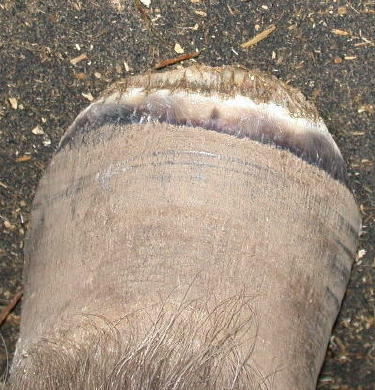 The tip of the toe no longer contacts the ground. 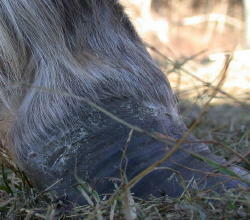 (the photos are of both front feet, both of which foundered).